By Keith Cowing on March 8, 2018 12:51 PM. "Before me are some rocket ships [there were rocket models in front of him on the table]. You haven't seen that for this country in a long time...Many of the jobs we're doing are privately financed. We're letting them use the Kennedy Space Center for a fee and, you know, rich guys, you know, they love rocket ships. That's good. That's better than us paying for them. And I noticed the prices of the last one they say cost $80 million. If the government did it, the same thing would have cost probably 40- or 50-times that amount of money...I'm so used to hearing different numbers with NASA." "But NASA is making tremendous strides and we're using a lot of private money, a lot of people that love rockets and they're rich. 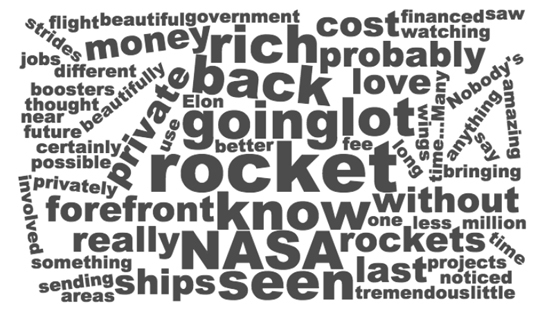 So they're going to be a little less rich probably, but a lot of rockets are going up. And we're really at the forefront -- nobody's doing what we're doing. And I don't know if you saw last -- with Elon -- with the rocket booster where they're coming back down. To me, that was more amazing than watching the rocket go up, because I've never seen that before. Nobody's seen that before, where they're saving the boosters, and they came back without wings, without anything. They landed so beautifully. So we're really at the forefront and we're doing it in a very private manner." "At the same time NASA is very much involved and doing their own projects, but we're bringing that whole space flight back. We'll be sending something very beautiful to Mars in the very near future, and we're going to areas that nobody thought possible, certainly not this quickly. So we're very proud." This page contains a single entry by Keith Cowing published on March 8, 2018 12:51 PM. NASA Phones In Summary of Deep Space Gateway Workshop was the previous entry in this blog. Now @NASA Is Retweeting Political Campaign Twitter Accounts is the next entry in this blog.